More than 2,000 children have been separated from their families at the U.S.-Mexico border in the five weeks since the Trump administration announced it was implementing a “zero tolerance” immigration policy—and it’s still not clear how, or when, those children might be reunited with their parents. On Wednesday, amid mounting pressure to end the policy, President Donald Trump signed an executive order that he said would keep families together, but it’s unclear what will become of the thousands of young people the U.S. government has detained since last month. Federal officials have few answers. “We’re still working through the experience of reunifying kids with their parents after adjudication,” said Steve Wagner, a top official at the Department of Health and Human Services, in a press call Tuesday. He pointed out that the policy was still “relatively new,” and acknowledged that despite the agency’s preference for reuniting detained children with their parents, officials were also working on “identifying alternative sponsors” if reunification isn’t possible. John Sandweg, a former acting director of ice, told me it’s entirely possible that children and parents will remain permanently separated. Not only could a parent and a child be deported at different times—sometimes years apart—but the passage of time and complexity of geographic distance make it difficult for parents outside of the United States to locate their children. For families who do eventually find one another, reunification will likely take time. “In a significant number of the cases, the child ends up in foster care,” Sandweg said. “Frankly, it can take weeks for HHS to locate a family member as well. The younger the kid is, the harder that is." The bureaucratic and political chaos of this moment stems from a federal policy, announced last month by Attorney General Jeff Sessions, to criminally prosecute anyone who crosses the border illegally. Prior administrations have been more selective in pursuing legal action against these individuals—in large part because of the implications for the many people who bring children with them. (Children cannot be kept in federal jail with their parents.) 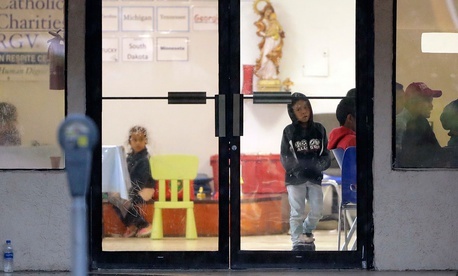 The Obama administration fielded its share of criticism for using family detention centers. Though there is little clarity around the reunification process, federal officials have clear guidance for taking children away from their parents: When an adult is arrested, the child or children accompanying them are turned over to the Department of Health and Human Services. The Office of Refugee Resettlement, which is within HHS, is required to place kids with a sponsor in the United States. “Our order of preference would be parents, close family friends, and friends of the family as a third category,” Wagner said. “When kids leave our care, they have received a notice to appear from the immigration court and the parents and sponsors to whom we released them are obligated to ensure that the kids appear for their court date.” The agency uses biographical information provided during the apprehension process to attempt to locate relatives in the United States, and then evaluates the sponsor’s relationship to the child, in addition to conducting background checks. If an eligible sponsor can’t be identified, the child is put in foster care. Over time, after proceeding through the immigration court system, some children are deported. Officials have provided an informational flier to some parents who are jailed. The document includes directions, in English and Spanish, for eventually locating their children. The flier lists a hotline number and asks that parents provide a full name, date of birth, country of origin, and if available, a registration number assigned to undocumented immigrants. But some parents have reported difficulty getting through to a person on the hotline. “I’ve heard that [there are] long wait times, no responses,” said Jennifer De Haro, a managing attorney for raices, one of the largest nonprofit legal-service providers in Texas. “Also if you’re out of the country, I’ve heard people aren’t sure how to access the phone number.” Some advocates have referred tofederal documents used in a parent’s immigration case to try to pin down where a child’s been located. In the meantime, children are kept in government facilities or short-term foster care. Photos released by U.S. Customs and Border Protection show children kept in chain-link pens, lying on mats on the floor. As these shelters reach capacity, it’s not clear where minors will be placed. Wagner said on Tuesday that the department maintains a network of 100 shelters in 17 states, but added that they don’t intend to move children who’ve been separated from their parents to other parts of the country. Recently, the administration opened a “tent city” along the Texas border with 450 beds to house the overflow of immigrant children. (CBP also used tents during Obama’s presidency.) Wagner said these “soft-sided” shelters will only be used to house teenagers. It could take weeks, if not years, for these children to be reunited with their parents. After a parent is prosecuted, he or she faces immigration proceedings—the only way to avoid this lengthy process is to waive one’s asylum claim, and as a result, be removed from the country immediately. If, however, parents choose to proceed with their claim, they may be released as they await their court date in which case they can serve as a sponsor and be reunited with their child, according to Customs and Border Protection. Reunification doesn’t usually happen “until the removal stage of the process,” a spokesperson for Immigration and Customs Enforcement told BuzzFeed News, adding that in some circumstances families could be reunited “sooner.” Some parents, however, have been deported after being separated from their child, The New York Times reported. Trump administration officials have reiterated their message that hardline immigration policies will curb illegal immigration at the southern border. “We expect that the new policy will result in a deterrence effect,” Wagner said Tuesday. “We are prepared to expand capacity as needed, we hope that that will not be necessary in the future.” But with no guarantee that the policy has, in fact, stunted the flow of immigrants to the U.S., children may spend weeks, if not months, wondering if they’ll ever see their parents again.